Lumigen ECL Plus (PS-3) is an acridan-based technology chemiluminescent and chemifluorescent substrate for sensitive detection of Western blotted proteins that are bound to horseradish peroxidase (HRP) labeled antibodies. Lumigen ECL Plus utilizes a unique acridan based technology for the chemiluminescent and fluorescent detection of horseradish peroxidase (HRP) conjugates. The reaction involves the enzymatic generation of thousands of acridinium ester intermediates per minute which react with peroxide at alkaline pH to produce sustained high-intensity chemiluminescence. Additionally, the reaction end-product exhibits a long-lasting fluorescent signal which can be detected on a CCD imaging device. 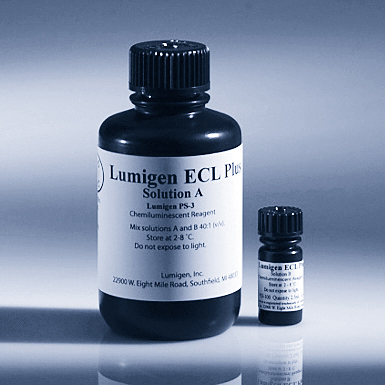 Visit the Lumigen store to purchase Lumigen ECL Plus on-line.